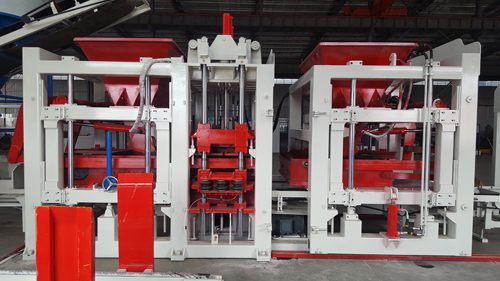 In the past one year, our updated HFB5230A brick making machine has passed all tests, from now on, we will promote the new product to our customers. Here are some comparisons between the old and the new machines. 1. The old one frame is 200*200mm with 8mm thickness, the new one frame is 200*200mm with 10mm thickness ( more stable during production). 2. The old one vibration platform supporting bar thickness is 15mm, width 30mm, no heat treatment. The new one Vibration platform supporting bar thickness is 25mm, width 40mm, with heat treatment (make sure no pallet broken when de-molding and increase the abrasive resistance ). 3. The old one has 3pcs flexible pallet supporters, the new one has 6pcs (More supporters can make sure the pallets get more supporting and wont sink down, then to avoid block come out with different height). 5. The old material feeder connecting lever use hollow arm, drawbar is hollow and joint by 2pcs, use 2 small motors. The new one using bigger and solid arm, drawbar is solid and one pcs only, so it will never be broken off. And the 2 small motors was replaced by one bigger motor, one will be more focusing and synchronous than two. 6. For the old machine, the material feeder box was drived by gear and chain, it need to be changed each half year. The new one solved this problem, the materials feeder box is drived by bearing, it can use 10 years and no need to change. 7. Feeder type of the old one is 360 rotating feeding type can feed the materials into the mold fast, but meanwhile it has the shortage, when here was jammed by big stone, the motors will be easy to cut off or burn. New machine change to swing type feeder, so even it jammed by big stone, the motors won’t cut off or burn. Secondly, it adds wear resistant sleeve and by heat treatment, so that it can be used longer. Also the new one adds stainless steel on the placing boom, so materials can be feeded into the mold more faster and uniformly.